Netanyahu, in the comments released by his office, was effusive in his gratefulness to Moscow for their assistance. “You have just now expressed the supreme value that you and the Russian people ascribe to finding the missing and bringing soldiers to burial. This is our common value,” the Israeli leader told Putin. While Netanyahu kept the full Russian involvement vague, he was able to give some additional insights in his comments with Baumel’s family, which he recapped to Putin on Thursday. “As I told them of your decision and about the fact that Russian soldiers took actions, sometimes at personal risk, they were open-mouthed and asked me to convey their deepest gratitude which is shared by all Israelis,” said Netanyahu. The Russian involvement continued on Thursday. In a ceremony, the Russian Defense Ministry presented Netanyahu with the remains of Baumel’s personal effects, noted an Israeli press release. An Israeli flag was placed on the casket carrying the effects and the Russian Defense Ministry orchestra played a requiem for the occasion. 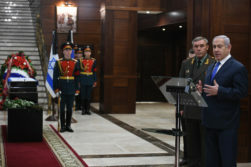 The Israeli flag was folded by the Russian honor guard and given to Netanyahu. 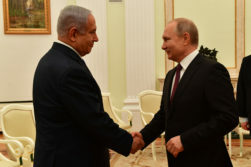 “This emotional day, and this moving ceremony, give further expression to the special bond between the Russian people and the Jewish people,” said Netanyahu at the ceremony in comments released by his office. IDF Lt. Col. Jonathan Conricus took to Twitter to express his thoughts on the recovery of Baumel. “Sometimes, as a military spokesperson, you also bring good news. Honored to be part of a military that doesn’t leave a stone unturned in the relentless quest to return its missing,” he tweeted along with a repost of an IDF Twitter feed video describing Baumel’s story. Sgt. 1st Class Baumel, an American-Israeli born in Brooklyn, was captured at the Battle of Sultan Yacoub—one of five Israeli soldiers who went missing in the fight. Two, Yehuda Katz and Zvi Feldman, remain missing. 37 years later, Sgt. Baumel was scheduled to be buried in Israel on Thursday. Incredibly, his family can thank the President of Russia for helping make that happen.